An idea for a new technology to reduce infection in pig farms saw a team of postgraduate students from the University’s Institute of Infection and Global Health win an award at a national enterprise competition. The Biotechnology Young Entrepreneurs Scheme (Biotech YES), now in its 20th year, is an innovative competition developed to raise awareness of the commercialisation of science ideas among early career researchers and is a blend of the formats made popular by television shows, Dragons Den and The Apprentice. 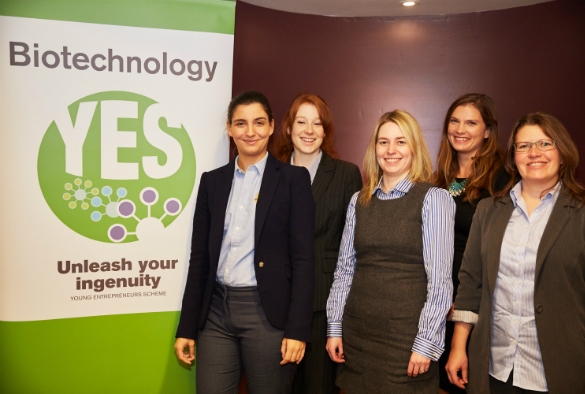 Following success in the North West regional heat in October, the Augean Technologies team, made up of veterinarian PhD students Alexandra Royden, Emma Ormandy, Gabrielle Laing, Maria Afonso and Marisol Collins, won the award for ‘Best Financial Consideration’ at the national final in London on 10 December. The team’s hypothetical pitch for £500,000 to develop a new antimicrobial coating technology for pig farms, which could offer a self-applicable and durable alternative to repeated disinfection and washing down of pig houses, was narrowly pipped to overall first place by a team from the University of Nottingham.